The Little Prince is a 2015 English-language French 3D animated fantasy adventure family drama film directed by Mark Osborne and based on the 1943 novella of the same name by Antoine de Saint-Exupéry. The film stars the voices of Jeff Bridges, Rachel McAdams, Paul Rudd, Bud Cort, Marion Cotillard, Benicio del Toro, James Franco, Ricky Gervais, Paul Giamatti, Riley Osborne, Albert Brooks and Mackenzie Foy. It is the first adaptation as a full-length animated feature of The Little Prince. The film relates the story of the book using stop motion animation, which is woven into a computer animated framing narrative about a young girl who has just met the book's now-elderly aviator narrator, who tells her the story of his meeting with the Little Prince in the Sahara desert. The film's animation was provided by studio Mikros Image. The film premiered on 22 May 2015 at the 68th Cannes Film Festival in an out-of-competition screening, followed by a wide release in France on 29 July by Paramount Pictures. The film was originally set to be released in theatres across the United States on March 18, 2016 before being dropped due to budget cuts; Netflix later acquired the US distribution rights and released it on August 5, 2016. The film has received positive reviews, earning praise for its style of animation and homage paid to the source material, and earned $97.6 million on a €55 million budget, becoming the most successful French animated film abroad of all time. An ambitious young mother just moving to a new neighborhood and imposes a life plan for her daughter that leaves no time for leisure, all for her to enroll in the prestigious Werth Academy. The girl, however, becomes distracted by her elderly retired aviator neighbor, who tells her the story of the "Little Prince", claiming that he encountered him in the Sahara after crash-landing there. The aviator recounts the Little Prince asking him to draw a sheep. Lacking skill, he drew a box instead, explaining that a sheep was inside, satisfying the Little Prince. The girl and the aviator continue to read and play together without the mother's knowledge. The aviator tells the girl about the Little Prince's home, "Asteroid B612", covered in baobab sprouts. He states that after clearing away the sprouts, the Little Prince found and nurtured a Rose into maturity. Despite becoming his friend, she was rather selfish, which caused the Little Prince to travel to elsewhere with a flock of birds. After meeting some adults on other asteroids, he eventually landed on Earth, meeting and taming a red fox. After a while, the fox bid goodbye to the Little Prince, advising him to always see with his heart. The aviator gives the girl a stuffed fox as a gift, telling her that he will leave soon to go find the prince. The two decide to go out for free "birthday" pancakes; when pulled over by a police officer, the aviator is revealed to have no license and the officer returns the girl home. Realizing that she has not been following the plan, her mother redoubles her daughter's assignments. Nevertheless, the girl continues to read the story of the Little Prince, secretly visiting the aviator to find out the story's ending. The aviator tells her that the Little Prince had succumbed to a venomous snake bite in order to be reunited with his beloved Rose. Although the aviator assures the girl that he firmly believes the Little Prince succeeded, she is so upset by the dark twist to the story that she wishes she had never met the aviator or heard the story. Towards the summer's end, the aviator is hospitalized. Wanting to put things right, the girl sets off in search of the Little Prince. Escaping through the gutter, the girl falls into the aviator's yard and blacks out. After she awakens, the girl, accompanied by her now-conscious stuffed fox (probably the reincarnation of the real one) and the Little Prince's story pages, flies the aviator's now-fixed plane into space. They find all the stars mysteriously gone, all the while landing on an asteroid populated by workaholic adults owned by the "Businessman" from the Little Prince's story, who captures and holds all the stars to power his asteroid and belongings. After encountering a police officer and an elevator operator – the "Conceited Man" and "the King" from the story – they finally find the Little Prince, who has become an adult named "Mr. Prince" and works as a janitor for the Businessman, having no recollection of his past. Mr. Prince accordingly takes the girl to an "academy" where she is to be "reconditioned" as an adult by a machine controlled by a sinister Teacher. Recognizing the drawing of his sheep's box from the aviator's pages, which he still kept the original (due to his amnesia, he believed that it might be important), Mr. Prince begins to recover his memories and saves the girl from the same fate that he had by putting the Teacher in the machine instead. They escape together and liberate all of the stars from the Businessman's glass vault, which return to their rightful place in the sky. The girl and the fox then take Mr. Prince back to B612, which is overgrown with baobabs. They find the Rose dead, but seeing her image in the sunrise, the baobabs disappear and Mr. Prince turns back to his younger self, giving him renewed hope. The girl and the fox return home, accompanied by another flock of birds. The next morning, the girl and her mother visit the aviator in the hospital. The girl presents him the formerly loose pages bound together as a book, along with all the formerly missing parts filled in. The girl afterwards begins her studies at Werth Academy and reconciles with her mother. Both of them happily stargaze one night, while the Little Prince and the aviator are heard laughing joyfully together on Asteroid B612. The film's crew at the Cannes Film Festival: (from bottom right) Mackenzie Foy, Riley Osborne, Mark Osborne, Marion Cotillard and other actors who provided the French and Japanese voices. Riley Osborne as the Little Prince, an eternally young boy and resident of "Asteroid B612", a small asteroid roughly the same size as him. Paul Rudd as Mr. Prince, the adult Little Prince who has forgotten his own childhood and become an anxious janitor for the Businessman. Mackenzie Foy as the Little Girl, a smart, feisty and precocious girl with a kind heart. She has a very inquisitive mind and struggles to balance growing up and basking in her childhood. Jeff Bridges as the Aviator, an eccentric and retired aviator who befriended the Little Prince in the Sahara Desert and acts as a mentor to the Little Girl. Rachel McAdams as the Mother, a busy and committed mother who cares for her Little Girl. James Franco as the Fox, a red fox whom the Little Prince cares for and tames, and who eventually becomes one of his many friends on Earth. Marion Cotillard as the Rose, a bright and beautiful rose whom the Little Prince cares for and talks to. Benicio del Toro as the Snake, a sly and venomous snake whom the Little Prince meets and is instantly wary of. Albert Brooks as the Businessman, an arrogant and greedy businessperson who owns the stars in the sky and generates money to buy more stars. Paul Giamatti as the Academy Teacher, a slim, tall and deceptive teacher who operates an "Academy", a place where children are transformed into workaholic adults. Bud Cort as the King, a king of an asteroid and whom the Little Prince visits. He becomes an elevator operator for the Businessman later in the movie. Ricky Gervais as the Conceited Man, a man who conceives a personality and sticks to it. He becomes a police officer for the Businessman later in the movie. Jacquie Barnbrook as the Nurse, a nurse in the hospital where the Aviator is hospitalized. Marcel Bridges as the Concerned Neighbour, a neighbour who's curious at the Aviator's attitudes. Jeffy Branion as the Policeman, a police officer who repeatedly arrests and detains the Aviator. On 14 October 2010, Kung Fu Panda co-director and More creator Mark Osborne was hired and set to direct The Little Prince based on the 1943 novel of the same name. Irena Brignull (writer of The Boxtrolls) and Bob Persichetti wrote the script for the film based on a story conceived by Mark Osborne. Aton Soumache, Alexis Vonarb and Dimitri Rassam produced the film with the budget of $70‒80 million for release in 2015. The film features a framing device not present in the novel with a schoolgirl discovering The Little Prince through a reclusive elderly neighbour. Mark Osborne made the film's hero a little girl after research from the Geena Davis Institute on Gender in Media revealed the gender disparity among characters in animated films. She represents "the spirit of adulthood," according to Osborne. "In animation, it always had to be boy-centric. Right now there seems to be a changing of the tide but these things don't happen overnight. These movies take years to make, so back when I was first pushing to make the little girl the main character, it was seen as quite revolutionary", Osborne recalled in April 2015. The film uses computer animation for the girl's world and stop-motion animation for the world of The Little Prince as she imagines it. Development and storyboarding of the film was completed in Paris. The team then moved to Montreal for the final phases of animation, lighting, colour and production in order to maximise the tax benefits offered to a French-Canadian project, a co-venture between Onyx Entertainment in Paris and Mikros Image Canada in Montreal. One of the film's associate producers is Brice Garnier from Canada's Kaibou Production. Kaibou service rendered Line production and service production (3D animation and stop motion). Studio partners were Studio Mikros Image Canada, Toutenkartoon Canada and Technicolor (picture and sound post-production). Kaibou also provided financing through tax credits, gap financing and local taxes. Osborne was pitching the film to actors, artists, and distributors all over the world using what he called a "magic suitcase" full of hand-made visual aids specifically created to communicate the tone and passion for the project. Model maker Joe Schmidt (the modeller of Coraline) created this suitcase, which held the art book, and told the story of the movie visually. Schmidt had created a snapshot of Osborne's vision for the film. A constellation of tiny planets and stars lit up on one side, a giant art book of illustrations filled the other. From somewhere deep inside the case, Osborne pulled out two large white circles that held slides that when placed up to each eye displayed 3-D images of stop-motion puppets. Then Osborne started flipping switches. In no time, a one-way mirror slid away to reveal a hidden chamber holding a collection of yellowed pages below. It was a mock-up of Saint-Exupéry's original manuscript, a key plot point in Osborne's film. In four years, Osborne pitched the movie close to 400 times. On 5 June 2013, it was announced that James Franco, Marion Cotillard, Mackenzie Foy, Benicio del Toro, Paul Giamatti, Rachel McAdams and Jeff Bridges joined the film. Albert Brooks joined the cast on 12 September to voice The Businessman, a villain. Thanks to Osborne's emotionally engaging pitch and the global popularity of Saint-Exupéry's book, a group of A-list actors were able to be recruited to lend their voices to the film's characters. As Osborne explained, "It began with Jeff Bridges. He was our first and only choice to play the Aviator, so after a great deal of time trying to get to him, I finally got the chance to go to his home in Santa Barbara to talk to him directly. He was blown away by the pitch, and it really put us on the road to assembling the perfect cast." As Bridges recalls, he was instantly drawn to the role of the Aviator. "Mark gave me this incredible pitch, brought this suitcase with him which showed me what the movie was going to be about. We shared the same concern, which was if you simply just move around these iconic characters like the book, it might not do justice to the work. He had this great other story, which treated the book as almost another character in the movie. It’s a great way to pay tribute to this classic book, so I was excited and thrilled to be part of it." 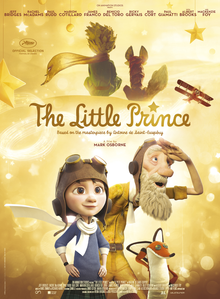 In the early stages of production, Mark Osborne's daughter Maddie and his son Riley, helped by providing the temporary scratch voices for the roles of the Little Girl and the Little Prince. His daughter got older and her voice began to change, so she had to be replaced by the 12-year-old Mackenzie Foy. Osborne's son Riley was kept as the voice of The Little Prince because they never found anyone who did a better job than him. "He was 11 at the time, and was very natural in the part so we kept him as the Prince! ", Osborne told. The film's score was composed by Hans Zimmer and Richard Harvey. Camille was featured in the film's soundtrack. The film was chosen in 'Official Selection' for the 2015 Cannes Film Festival on 22 May 2015. The Little Prince made its US premiere at the Santa Barbara Film Festival on 3 February 2016. It was the first animated movie to open the Santa Barbara Film Festival since the festival started in 1985. Wild Bunch is overseeing international film sales. Paramount Pictures released the film in France on 29 July 2015 and in some other countries, and had also intended to handle distribution in the United States. The film was also released in other territories by Entertainment One in Canada, and The Weinstein Company in the UK, Australia and New Zealand. Warner Bros. assumed distribution in Austria, Germany and Japan. The film was to be released via Paramount Animation in the United States on 18 March 2016 in RealD 3D. However, on 11 March, a week away from its release, Paramount dropped the planned release for the region. According to Cartoon Brew, Paramount left because the French producers did not pay an additional, previously agreed $20 million for the U.S. prints and advertising budget. Netflix later acquired the US distribution rights and released the film on 5 August 2016. On 11 September 2014, Warner Bros. Japan released a teaser from the film. The first trailer in French was released by Paramount Pictures on 8 December 2014. The first trailer in English was released on 12 December 2014. The first official English trailer and the first poster for the film were released on 20 April 2015. eOne Canada released a new trailer on 13 November 2015. The first full U.S. trailer was released by Paramount Pictures on 25 November 2015. As of 20 September 2015, it had grossed $12.1 million in France and, as of 20 March 2016, $88.7 million worldwide. In its opening week in France, The Little Prince earned $3.3 million from 727 screens debuting at No. 2 at the French box office. In its second weekend it grossed $1.4 million (down 41%) from 830 screens for a two weekend total of $5.5 million. The film debuted at No. 2 in Brazil on 20 August, behind of Mission: Impossible – Rogue Nation, with 330 thousand tickets sold. In its second weekend, it topped the box office charts, with over 851,000 tickets sold, making history in Brazil as the first non-American animated film to lead the box office in the country. The film kept the first place at the Brazilian box office for three consecutive weeks. As of 5 October, the film has grossed over R$27 million (US$7.14 million) and as of 18 October, it reached over 2 million admissions in Brazil. The film opened in China on 16 October, where it grossed $10.9 million in its opening weekend ranking third behind Ant-Man and Goodbye Mr. Loser, It grossed a total of $20.9 million in 10 days and by its third weekend, it had grossed US$24 million. It grossed a total of CN¥158.45 million in China, with the country being the largest territory for the film. It was number-one on its second weekend in Japan. The film has received critical acclaim, earning praise for its style of animation and homage paid to the source material. On Rotten Tomatoes, the film holds a score of 93%, based on 95 reviews, with an average rating of 7.27/10. Its consensus reads: "Beautifully animated and faithful to the spirit of its classic source material, The Little Prince is a family-friendly treat that anchors thrilling visuals with a satisfying story." On Metacritic, the film has a score of 70 out of 100, based on 23 critics, indicating "generally favourable reviews". Furthermore, The Sydney Morning Herald reinforces positive reviews on the film, stating "it is deeply personal and profoundly moving, a sensitive and affecting portrait of humanity". ^ a b "Cannes 2015 Schedule". Rachel McAdams Online. 7 May 2015. Retrieved 7 May 2015. ^ a b "Le Petit Prince". Facebook. 4 February 2015. Retrieved 4 February 2015. ^ "The Little Prince". British Board of Film Classification. Retrieved 3 June 2018. ^ a b c Giardina, Carolyn (8 August 2016). "'The Little Prince:' How Director Mark Osborne Gave the Classic a Modern Update". The Hollywood Reporter. Retrieved 3 June 2018. ^ "The Little Prince (2016)". boxofficemojo.com. Retrieved 15 June 2016. ^ Keslassy, Elsa (20 April 2015). "Watch Second Trailer for Mark Osborne's Cannes-Bound The Little Prince (Exclusive)". Variety. Retrieved 20 April 2015. ^ a b Kit, Borys. "Paramount Animation sets release dates for Little Prince, Spongebob Squarepants 3". The Hollywood Reporter. Retrieved 10 November 2015. ^ Vejoda, Jim (11 March 2016). "Paramount Drops The Little Prince a Week Before Release - IGN". IGN. Retrieved 12 March 2016. ^ "The Little Prince is now the most successful French animated film abroad to date". UniFrance. 3 December 2015. Retrieved 2 February 2016. ^ Mejia, Paula (21 April 2015). "Big-Budget The Little Prince Film Unveils Official Trailer". Newsweek. Retrieved 8 May 2015. ^ Foundas, Scott (22 May 2015). "Film Review: The Little Prince". Variety. Retrieved 21 June 2015. ^ a b c d e f g h "Press Kit: The Little Prince" (PDF). festival-cannes.com. Retrieved 22 January 2016. ^ a b "'The Little Prince's' latest journey full of bold, unexpected choices". Los Angeles Times. 8 January 2016. Retrieved 2 February 2016. ^ "How's the movie industry treating women this week?". The Dissolve. 17 April 2015. Retrieved 2 February 2016. ^ Goodfellow, Melanie (5 May 2014). "Wild Bunch boards Little Prince". Screen Daily. Retrieved 10 December 2014. ^ a b c "The Little Prince". Unifrance. Retrieved 1 September 2016. ^ a b "Mikros Image: Le Petit Prince renaîtra à Montréal". La Presse Canada. 3 September 2013. Retrieved 26 January 2016. ^ "A Big Solution for The Little Prince". ProSight Specialty. 4 May 2015. Retrieved 26 January 2016. ^ a b "Our Achievements". Kaibou Production. Retrieved 2 February 2016. ^ "The Little Prince, a Franco-American animated feature". FrenchFlicks.com. 9 June 2015. Retrieved 26 January 2016. ^ "James Franco, Rachel McAdams, Jeff Bridges Among Voice Stars for The Little Prince". The Hollywood Reporter. 5 June 2013. Retrieved 15 September 2013. ^ "Albert Brooks lends voice to The Little Prince". Deadline Hollywood. 12 September 2013. Retrieved 15 September 2013. ^ "Hans Zimmer to score The Little Prince". Film Music Reporter. 10 December 2014. Retrieved 10 December 2014. ^ "The Little Prince Movie Information". soundtrack.net. Retrieved 17 August 2015. ^ ""The Little Prince" Cannes 2015". Cannes Film Festival. 14 May 2015. Retrieved 14 May 2015. ^ "Why Santa Barbara Film Fest Is Kicking Off With an Animated Movie". The Hollywood Reporter. 3 February 2016. Retrieved 4 February 2016. ^ Vlessing, Etan (20 May 2014). "Cannes: Entertainment One acquires trio of films for Canada". The Hollywood Reporter. Retrieved 23 March 2015. ^ "Harvey Weinstein reveals Southpaw Cannes slot offer". Screen Daily. 14 May 2015. ^ Vejvoda, Jim. "PARAMOUNT DROPS THE LITTLE PRINCE A WEEK BEFORE RELEASE". IGN. Retrieved 13 March 2016. ^ Amidi, Amid (2 January 2017). "Netflix Made A Parade Float to Remind Award Season Voters: Don't Forget About 'The Little Prince'". Cartoon Brew. Retrieved 3 January 2017. ^ Terreo, Nina (26 May 2016). "The Little Prince gets a new trailer and release date". Retrieved 26 May 2016. ^ Kilday, Greg. "Netflix Picks Up 'The Little Prince' from Paramount". The Hollywood Reporter. Retrieved 18 March 2016. ^ "The Little Prince 2015 Japanese Teaser". Yam-Mag.com. 12 September 2014. Retrieved 12 September 2014. ^ "Full International Trailer for French Animated Film 'The Little Prince'". FirstShowing.net. 19 November 2015. Retrieved 20 August 2016. ^ "Here's a First Look at The Little Prince Movie". TIME.com. 9 December 2014. Retrieved 4 February 2016. ^ "THE LITTLE PRINCE 2015 Trailer (English)". YouTube. 12 December 2014. Retrieved 4 February 2016. ^ "Adorable Trailer & Poster For THE LITTLE PRINCE". The Hollywood Reporter. 25 April 2015. Retrieved 4 February 2016. ^ "'The Little Prince' Trailer Unveiled for Cannes — Watch". Magazine. 20 April 2015. Retrieved 4 February 2016. ^ "The Little Prince Official Teaser Trailer - In theatres March 11". YouTube. 13 November 2015. Retrieved 4 February 2016. ^ "Watch: Lovely Full US Trailer for Animated 'The Little Prince' Movie". FirstShowing.net. 25 November 2015. Retrieved 4 February 2016. ^ Tartaglione, Nancy (21 September 2015). "Scorch Trials Heats Up $43.2M; Everest Scales $28.8M – Intl Box Office Final". Deadline Hollywood. Penske Media Corporation. Retrieved 22 September 2015. ^ "The Little Prince (2015)". the-numbers.com. Retrieved 20 March 2016. ^ Tartaglione, Nancy (3 August 2015). "Rogue Nation Puts Cruise in Control at $64.5M Offshore; Sets Career & M:I Franchise Bests – Intl Box Office Final". Deadline Hollywood. Penske Media Corporation. Retrieved 4 August 2015. ^ Tartaglione, Nancy (10 August 2015). "Rogue Nation Flies Higher In 2nd Frame with $65m; Fantastic Four No. 2 With $33.1M Bow – Intl Box Office Update". Deadline Hollywood. Penske Media Corporation. Retrieved 11 August 2015. ^ "Bilheterias Brasil: O Pequeno Príncipe não consegue tirar Missão Impossível da liderança" [Box office Brazil: The Little Prince cannot take the leadership from Mission: Impossible]. adorocinema.com (in Portuguese). 24 August 2015. Retrieved 18 September 2015. ^ "Bilheterias Brasil: Na segunda semana de exibição, O Pequeno Príncipe assume a liderança" [Box office Brazil: On its second week of release, The Little Prince takes the lead]. adorocinema.com (in Portuguese). 31 August 2015. Retrieved 18 September 2015. ^ "Comédia brasileira Vai Que Cola estreia no topo das bilheterias do país" [Brazilian comedy Vai Que Cola débuts at the top of the country's box office]. cinema.uol.com.br (in Portuguese). 5 October 2015. Retrieved 28 October 2015. ^ "Bilheterias Brasil: O Pequeno Príncipe" [Brazil box office: The Little Prince]. adorocinema.com (in Portuguese). Retrieved 28 October 2015. ^ a b "小王子 (2015)". cbooo.cn (in Chinese). Retrieved 24 September 2016. ^ "The Little Prince launches in China with $10.8 million". cartoonbrew.com. 20 October 2015. Retrieved 26 October 2015. ^ Brzeski, Patrick (20 October 2015). "China Box Office: Ant-Man goes big with $43m début". The Hollywood Reporter. Prometheus Global Media. Retrieved 20 October 2015. ^ Brzeski, Patrick (27 October 2015). "China Box Office: Ant-Man Stays Strong, Pan Flops Hard on début". The Hollywood Reporter. Prometheus Global Media. Retrieved 27 October 2015. ^ Frater, Patrick (2 November 2015). "China Box Office: The Witness Sees Victory Over Ant-Man". Variety. Retrieved 3 November 2015. ^ "The Little Prince". Box Office Mojo. Retrieved 24 September 2016. ^ Schilling, Mark (30 November 2015). "Japan Box Office: Prince Takes The Throne". Variety. Retrieved 3 December 2015. ^ "The Little Prince (2016)". Rotten Tomatoes. Retrieved 2 April 2016. ^ "The Little Prince reviews". Metacritic. Retrieved 2 April 2016. ^ Idato, M. (2016). "Review: The Little Prince, Transported to a Whole New World". ^ Anderson, Erik (15 December 2016). "Austin Film Critics Association (AFCA) Nominations: The Handmaiden Lands Top Mentions, Trevante Rhodes Double Nominated". AwardsWatch.com. Retrieved 15 December 2016. ^ Miller, Neil (15 December 2016). "2016 Austin Film Critics Awards Nominees, 'Moonlight' and 'Arrival' lead the way in AFCA's 2016 nominations". Medium.com. Retrieved 15 December 2016. ^ "César Award Nominations 2016 — Full List". Deadline Hollywood. 27 January 2016. Retrieved 2 February 2016. ^ "Justin Timberlake & Alexandre Desplat Among Winners At Hollywood Music In Media Awards". Deadline. 18 November 2016. Retrieved 18 November 2016. ^ McNary, Dave (2 November 2016). "'La La Land' Scores Three Hollywood Music in Media Nominations". Variety. Retrieved 3 November 2016. ^ "44th Annie Award Nominees". International Animated Film Society. 28 November 2016. Retrieved 29 November 2016. ^ Giardina, Carolyn (10 January 2016). "'Rogue One' Leads Visual Effects Society Feature Competition With 7 Nominations As 'Doctor Strange,' 'Jungle Book' Grab 6 Each". Hollywood Reporter. Retrieved 10 January 2016. ^ McNary, Dave (2 March 2017). "Saturn Awards Nominations 2017: 'Rogue One,' 'Walking Dead' Lead". Variety. Retrieved 2 March 2017. Wikimedia Commons has media related to The Little Prince (2015 film). This page was last edited on 30 March 2019, at 03:27 (UTC).